This is Kiwa under sail on Lake Superior. Kiwa is a C&C30 built in 1974 at Niagara-on-the-lake, Ontario, Canada. She was originally named "Insatiable", until being renamed "Kiwa" on December 31, 1988. 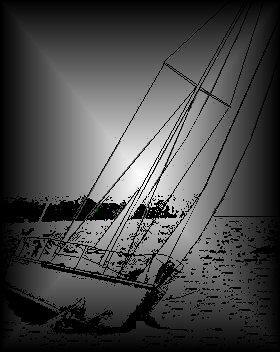 Kiwa is in the Sailboats Inc. charter fleet out of Bayfield, Wisconsin. This puts her at the south entrance to the Apostle Islands, a wonderful place to sail. For insurance purposes, all charters are handled through Sailboats. The NOAA weather report for the Apostles. Curious? What are the important NOAA descriptors for the Apostles? Forward berth, the removeable bulkhead protects the anchor rode. Put the screen on first. Put the bungee over the chain behind the wooden ridge. Make sure the hook is directly in contact with the wood at each end. That alcohol stove. Alcohol stoves are much safer than propane, but they require a little more work to light. The secret is to heat up the center element BEFORE you open that stove element. As usual, pressurize the tank and open the tank valve (A). Pour one tablespoon of stove alcohol (look for the small bottle labeled "Stove Starter") into the pan below the center of the burner being lit (B). Let it nearly burn out. Crack that burner's valve (C) - if the center element (D) is hot enough the gas will ignite in a neat blue flame. If it is not hot enough, close the valve (C) and burn another tablespoon to heat the center more. IF THE CENTER IS NOT HOT ENOUGH THE CENTER OF THE ELEMENT FILLS WITH TOO MUCH ALCOHOL, AND YOU GET UNBURNED ALCOHOL VAPORIZING INTO THE CABIN. THIS BURNS THE THROAT AND SMELLS AWFUL.